STOCKTON -- It's difficult to describe how it feels when your childhood dream becomes a reality. As he stood by his race car at Stockton 99 Speedway, Pete Anderson Jr. tried to find the proper words. He said it was great, special and unbelievable to become the first Stocktonian to win the track's Western Late Model title, but none of those words seemed to work. 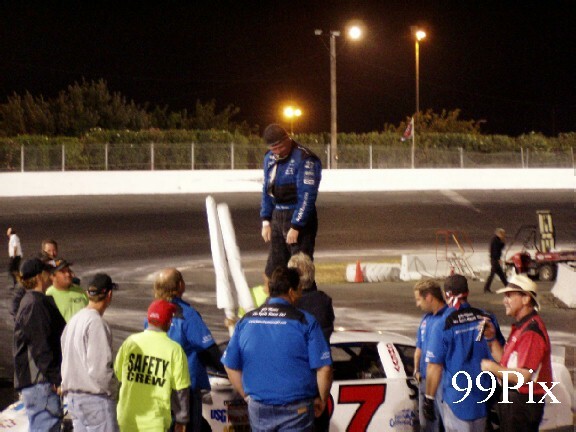 Anderson finished second in the 100-lap WLM season finale to secure the championship, becoming the first Stockton resident to win a late model title at the track since the division began in 1973. John Moore of Granite Bay won the race in front of a crowd of 4,014. 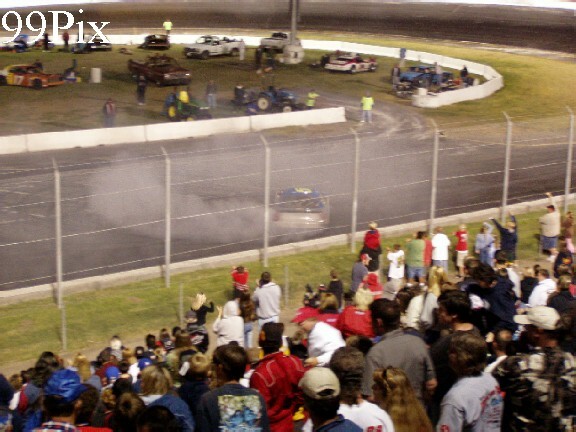 Anderson, who came to Stockton 99 to watch races as a youngster and has been racing at the track since he was 16 years old, celebrated by doing doughnuts on the front straightaway. "I have to admit, I really don't know what to say, and it's just sinking in," said Anderson, 30. "Wow, this is something I've wanted most of my life." Allison Duncan of San Rafael finished second in the WLM point standings and took a moment to congratulate Anderson after the race. "Pete certainly deserves it. He did a wonderful job," she said. He clinched the crown with his usual display of consistency. He finished in the top five in 17 of the 18 races, and was never out of the top five. 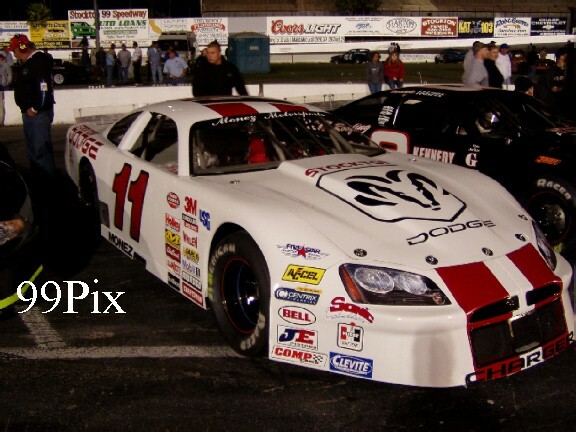 He qualified second Saturday and ran in the top five the entire race. He did have an incident when he and Guy Guibor, #61, of Manteca made contact on lap 40, and Anderson, #5, decided to get more aggressive. "At first I was going to lay back, but there were so many fast cars, I figured we might as well try to move up," Anderson said. "If you stayed back, cars were going to come up and challenge you." Moore, who was knocked out of the points race after a pair of disqualifications in August, won for the sixth time this season. "I'm glad we finished the season this way, and I want to congratulate Pete," Moore said. "He's a good champion." 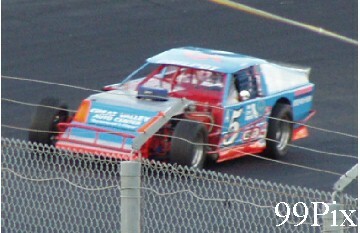 Kyle Gottula won the Grand American Modified main event and celebrated by spinning across the finish line. Unfortunately for Gottula, Mike Beeler of Modesto didn't see the winner through the smoke and slammed Gottula's car as he finished the race. "I did it for the crowd. I wanted to spin across the finish line, but I spun too early," Gottula said. Jason Philpot of Sacramento finished third and clinched the Grand American Modified championship. Ron Robeck #3 of Milpitas made an exciting last lap pass and won the final Pro 4 Truck main event, but Mark Henslee, #6, of Lathrop finished second giving him a big enough points lead to claim the season title in his first season in the division. "I never would have thought this would happen," Henslee said. "To do this in our first season is unbelievable." Bryan Hitchcock won the Trophy Dash. STOCKTON -- Great sports competitors live, breathe, eat and sleep their sport, all the while dreaming of becoming a champion. Stockton's Pete Anderson Jr. is no exception. 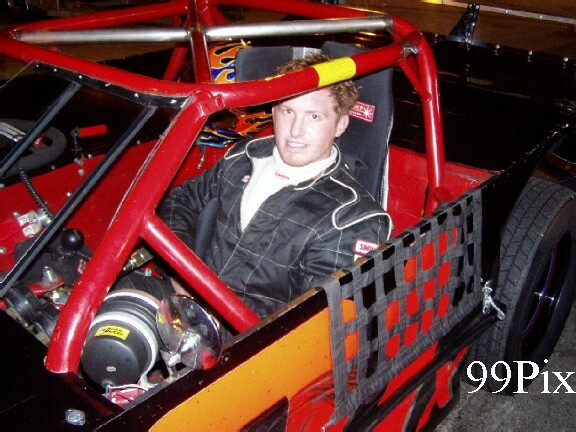 The 34-year-old, second-generation driver has been racing at Stockton 99 Speedway since he was 16 and dreaming of track championships ever since he first put rubber to pavement. In the 14 seasons that he's been competing, he's built a crack pit crew, gained experience and amassed hometown sponsors. On Saturday, Sept. 17 Anderson Jr.'s years of dedication paid off in the form of the 2005 HAVOLINE Western Late Model championship, claimed following his second place finish in the final 100-lap race of the year. "I guess we'll head back to the pits to celebrate," said a smiling Anderson Jr., surrounded by pit crew, family and friends on the front-straight, "Then party!" 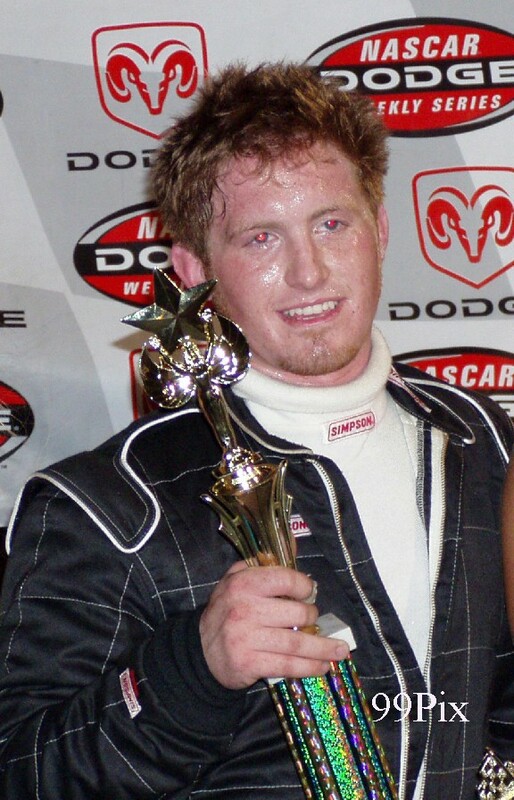 Anderson Jr. claimed the 2005 title with a combination of main event wins and consistent finishes in the top five. 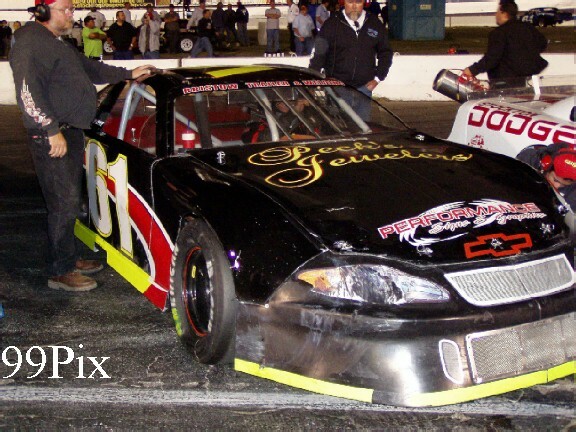 Over the course of the 18-race HAVOLINE Western Late Model season he earned six main-event victories, including two claimed in 100-lap challenges, and 17 top-five endings. His total point count came in at 1,029. "I said all along that I was racing to finish in the top five," said #5, Anderson Jr. "But if I got in position (to win) I'd go for it." 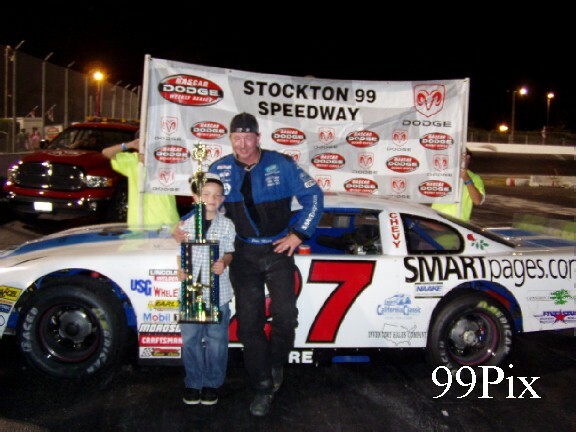 Anderson Jr., who won a Pure Stock championship several years ago, is now the first driver hailing from Stockton to claim a Stockton 99 Speedway premier division, late model stock car championship. 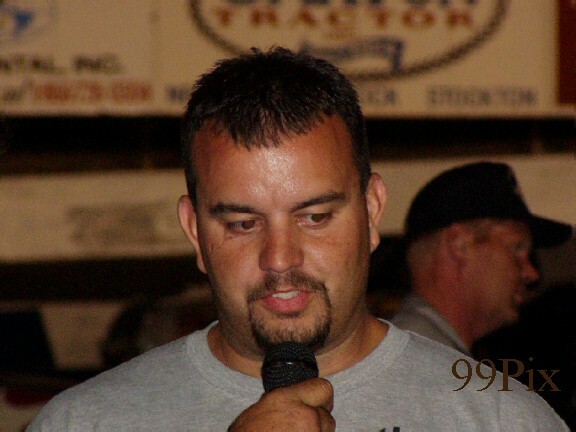 Following the win, amidst a shroud of cheers coming from the 4,014 fans that watched him cruise to the championship, Anderson Jr. indicated that he is already thinking about Stockton 99 Speedway's 2006 season. "I only live a mile away from here," said the champ. "It wouldn't make sense for me to drive somewhere else to race." 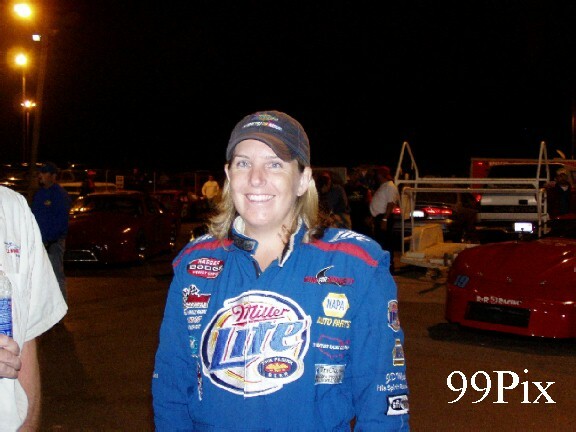 San Rafael's #20, Allison Duncan, 26, claimed the second place spot in the 2005 HAVOLINE Western Late Model division with 951 points. 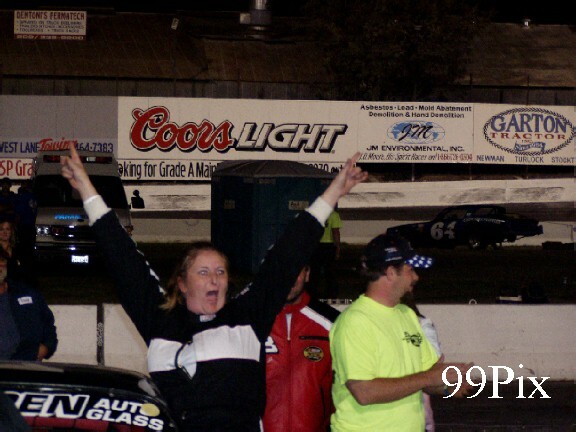 The Stockton 99 Speedway rookie, brought to the track by Bill McAnally racing as part of the NASCAR Driver for Diversity program, is the first female driver ever to climb so high in a premier division. Duncan claimed two main-event wins this season. 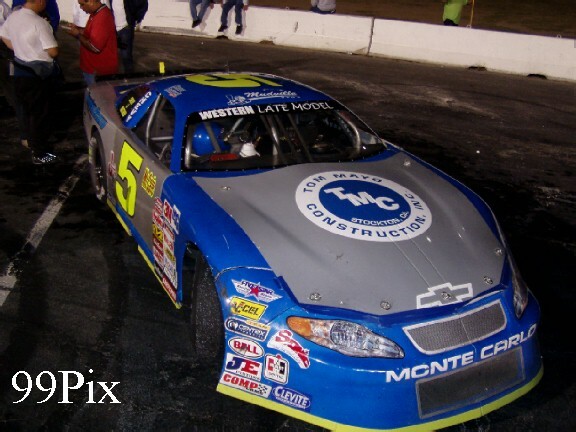 The remaining 2005 HAVOLINE Western Late Model division top five finishers were: Granite Bay's John Moore, he ended the season at third with 907 points and won six mains. After winning the race, Moore parked his #27 WLM Race car at the spot his son had been killed this year and took a moment , having dedicated the season to his son. Turlock's Chris Monez finished the season at fourth with 884, he piloted a reverse paint scheme #11, STOCKTON DODGE Intrepid to a main event win and a division sweep. Stockton's Gary Shafer Jr. took fifth with 812, he won two main events this season. Moore won Saturday night's 100-lap race, Anderson Jr. finished second, Manteca's #61, Guy Guibor came in third, Stockton's Danny Contessotto finished fourth and Roseville's Mike Mansch rounded out the top five. 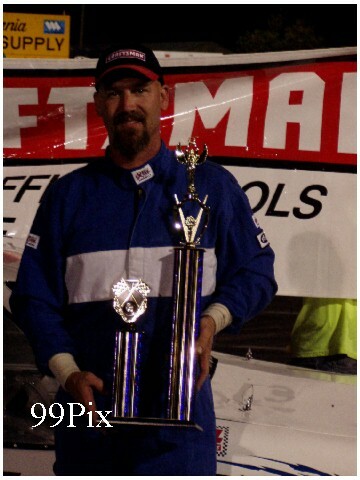 Pro-4 Trucks division rookie Mark Henslee claimed the division title with 944 points. "Great!" said Henslee from the track's infield in describing how he felt to have won. "It was unexpected, all I wanted to do was come out and race and finish in the top five." The champion out of Lathrop had a great run this season, claiming five main event wins and consistently finishing in the top five. Milpitas Ron Robeck came in second in the division with 944 points, Lodi's Mike Curry came in third with 866 points, rookie Nathan McNeil out of Oakdale came in fifth with 830 points and Manteca's Brian Hitchcock rounded out the top five with 792. Hitchcock also won the Trophy Dash. 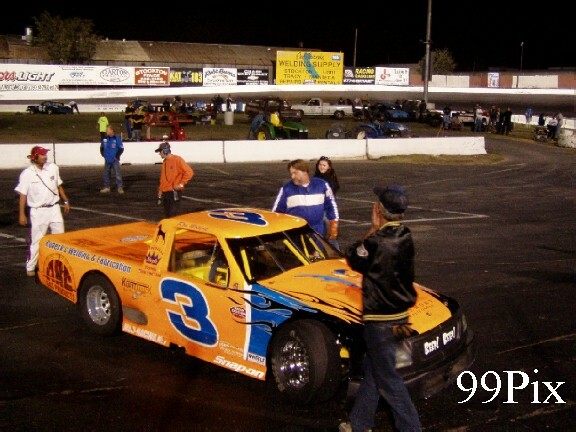 In Saturday night's 25-lap Pro-4 Trucks race Robeck captured first when he made a late race move around Henslee on the back straight. 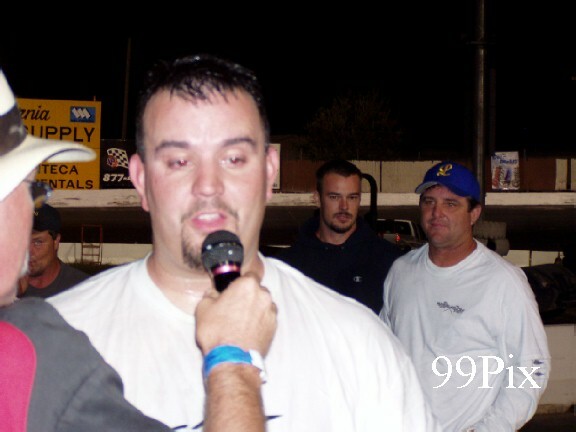 Henslee took second, Hitchcock placed third, McNeil came in fourth and Ripon's Tim Fernandes Sr. came in fifth. 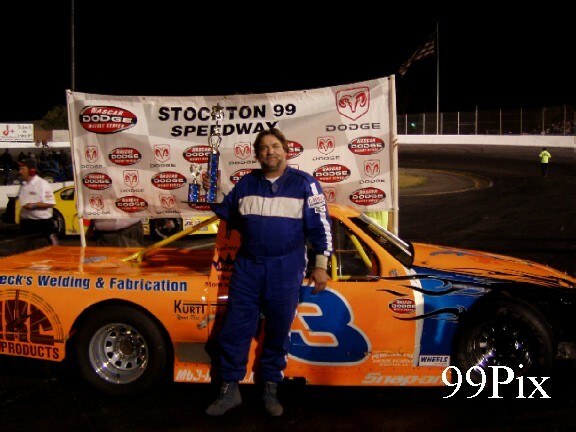 Sacramento's #5, Jason Philpot claimed his second Stockton 99 Speedway NASCAR Grand American Modified division championship Saturday night. "It feels great," said Philpot. "It's a surprise, especially since I didn't come out here to win a championship this season." Philpot had an up-and-down year, claiming three main-event wins, several top-five finishes and a few evenings of bad luck. Never the less, his 621 points were enough to secure the title. 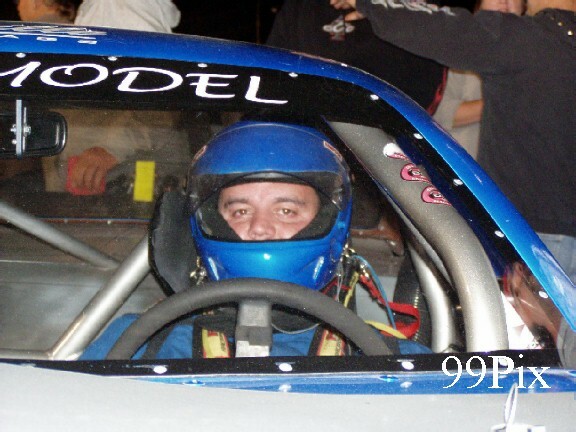 Like his Western Late Model counterpart, Philpot also has his eye on Stockton 99 Speedway for next season, saying that he'd like to try for a third GAM championship. Modesto's #21, Kyle Gottula finished Saturday's main in first and took second in the division with 574 points. 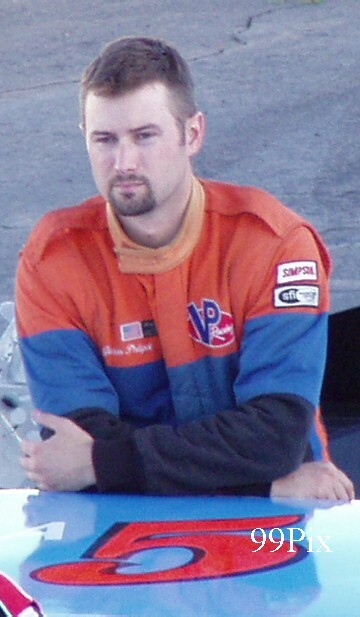 Salida's Sam Solari, who has indicated that he could seek the Western Late Model championship in 2006, finished the division in third with 568 points. Dixon's Jerry Dubach came in fourth with 564 points and Modesto's Mike Beeler rounded out the division top five with 503. Beeler finished Saturday night's race in second, Philpot came in third, Solari finished fourth and French Camp's Tony Noceti landed in fifth. Every now and then the Stockton 99 Speedway crowd thins following the Western Late Model main event, not Saturday. Fans remained glued to their seats until the very end so as not to miss one minute of the exciting, metal crunching action of the GIANT school bus race and destruction derby! 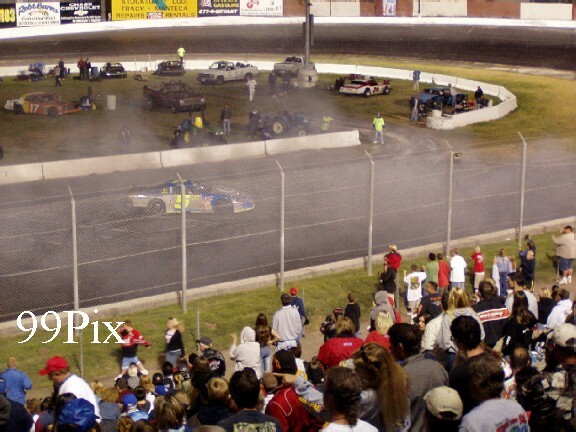 Five full-sized busses took to the track for a 10-lap smash-up race, then committed to the front-straight and plowed into each other until just one was left. 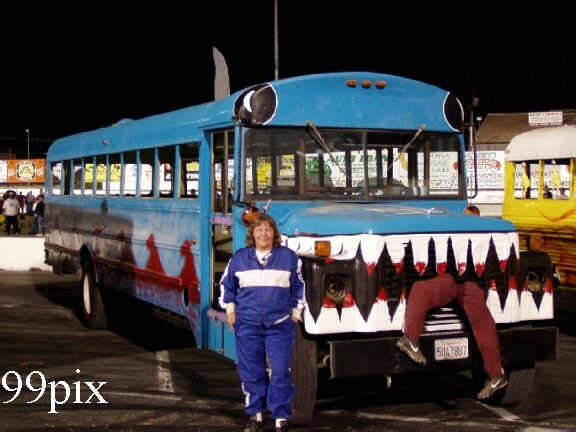 After the smoke cleared and dust settled, Brentwood's Debbie Foreman emerged from her shark themed buses, with the legs of a victim sticking out of her grill, the victorious bus and took the win in the name of "Girl Power!" For lots more pictures of the Buses, Click Here! The annual Powder Puff derby started 12 cars on the track and the once-a-year drivers didn't hold anything back! 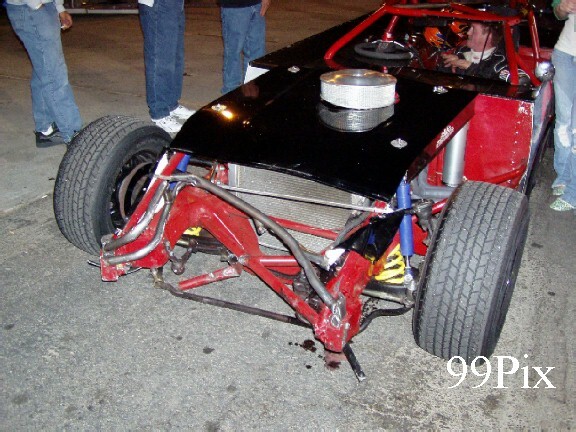 The rough-and-tumble 25-lap race drew caution after caution and even saw the number 3 car of Tamara Rider flip completely over! No one was injured in the event and Modesto's Mary Saunders claimed the 2005 Powder Puff title. What was so incredible is that Tamara had obviously never driven on the track, not being able to practice friday night because the car wasn't ready, but had definite ideas on what she wanted. She had requested the "Intimidators" #3 and as a surprise her husband had prepared a surprising replica of the Great Man's car! She then proceeded to get the proper attire at the 99 Speedway Souvenir Store, (where I heard this story), an did she was off to the races. Little did she know what kind of night she was in for. 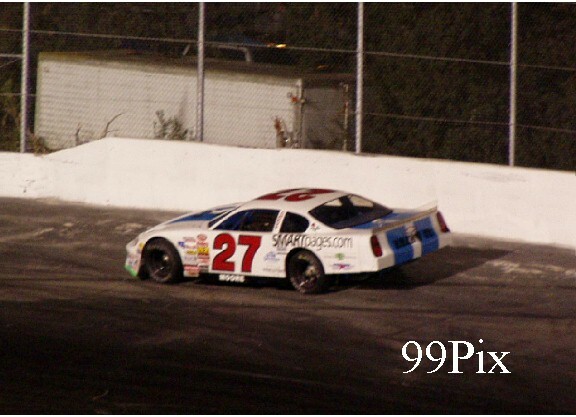 As she practiced during hot laps, she under negotiated turn 2 and climbed the wall. Surely her night was over before it started. After quick repairs, she was back at it and competing in the events. As reported above, she flipped the car on it's lid and caused a lengthy delay as a fork lift was used to right the belly-up vehicle. It was flat as a pancake. 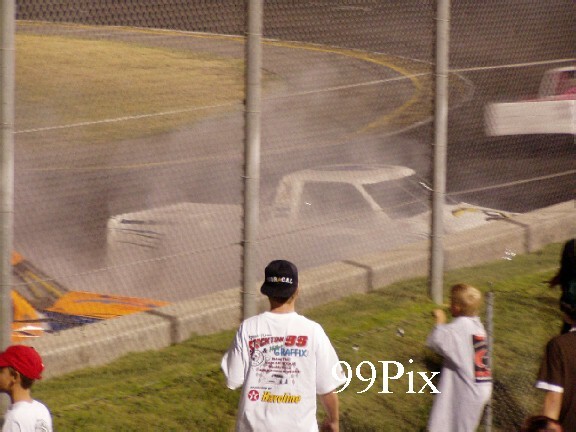 But obviously, the Intimidator was watching, (remembering his famous "Crash Car" day when he returned to finish the race after barrel rolling down the front stretch at Daytona, then finishing the race), and somebody tried staring Tamara's #3's engine. It started and to the amazement of the crowd #3 was back!! She even participated in the nose to wall group burn-out the Powder Puffer's celebrated with. Nobody was more surprised than myself after meeting this demur mother who was going to race in the "Powder Puff"! For Lots of Powder Puff Pictures, Click Here! 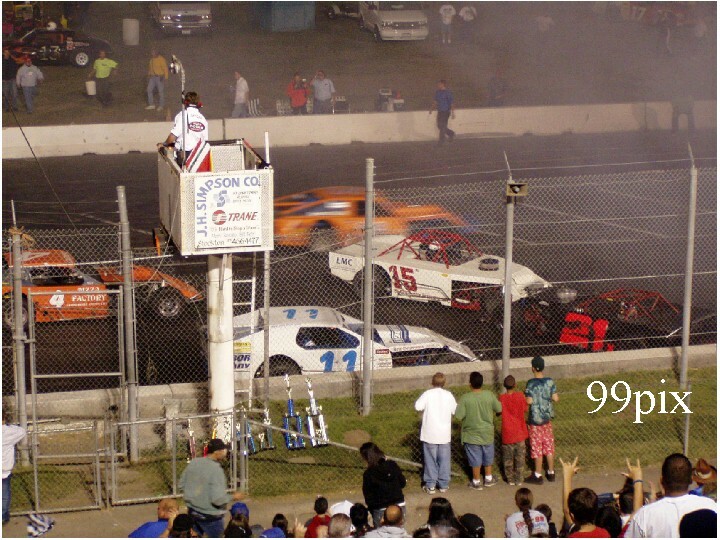 2006 will be Stockton 99 Speedway's final NASCAR season. Opening day will be Sunday, April 2. Any driver who wants a last shot at challenging Anderson Jr., Philpot, Henslee or Modesto's Charlie Clawson for their titles had better plan on being at the track, as all have indicated that they will be back for the final season. 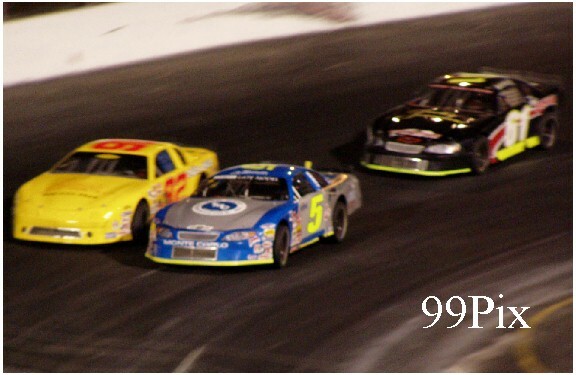 This season Stockton 99 Speedway brought race fans 22 events, which included 20 NASCAR DODGE Weekly Series events, 18 with HAVOLINE Western Late Model races. 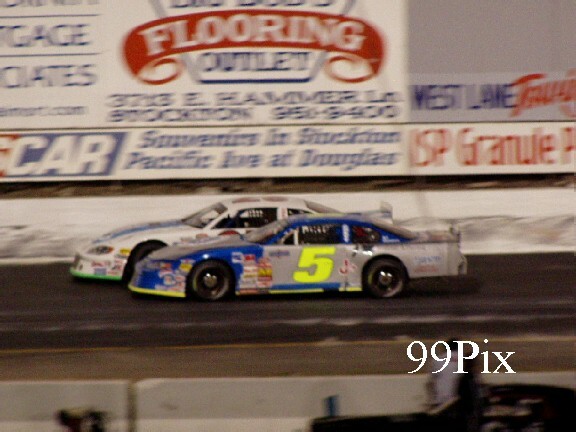 Also at Stockton 99 Speedway in 2005 were the NASCAR Grand National Division West Series, NASCAR AUTOZONE Elite Division Southwest Series, SRL Wildwest Shootout, USAC Sprints, Midgets and Ford Focus, California Mini Racing Association Mini Cups and Legends of the Pacific. Stockton 99 Speedway's major season sponsors have included HAVOLINE and CL BRYANT; NITRO GRAFFIX sponsored the final night of racing. 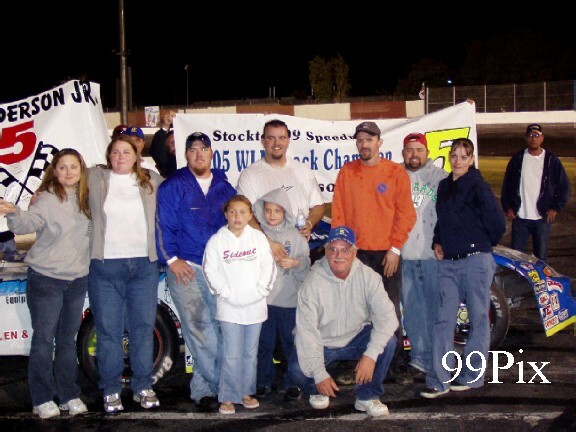 Stockton 99 Speedway's last 2005 event is the annual awards banquet. To be held Oct. 8, the banquet brings drivers, fans, family and friends together for a final evening of food, fun, drink and celebration in honor 2005's drivers and contributors to the track. During the event, awards for all divisions will be dispersed and fans will have a great opportunity to meet and mingle with their track favorites. It is being held at the Stockton Inn, 4219 East Waterloo Road, Stockton. The evening starts at 6 p.m. with no host cocktails, dinner and awards commence at 7 p.m. Cost is only $40 per person for an all-you-can-eat buffet. Sept. 23 is the reservation deadline, there are no tickets available at the door. Send check or money order, paid to Stockton 99 Speedway, to Sherri Nelson, PO Box 844, Soulsbyville, CA 95372. Call 209-928-1135 for information, or download a copy of the reservations flyer at stockton99speedway.com. To make overnight reservations at the Inn call 877-293-8697. 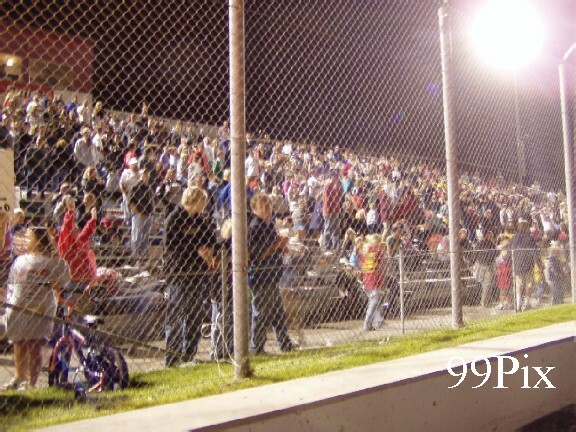 It's been a great season of racing, Stockton 99 Speedway looks forward to welcoming back drivers and fans in 2006!